Measles in Australia is almost always imported by travellers; there have been many outbreaks of this highly contagious disease in 2018-19 in many countries. Travellers who were born after 1966 (aged under 52?) need to ensure they have had 2 doses of the measles vaccine or documented measles disease or a blood test to confirm immunity. NSW has had 11 cases of measles since Christmas 2018. Recently an alert was issued about a man in his 50’s returning from Manila in the Philippines who was contagious during his flight home to Sydney. Recent alerts have also been issued about a traveller with measles in Melbourne who had visited David Jones in the CBD and the Queen Victoria Market. In South East Asia Thailand is currently having 150 cases per week (! ), the Philippines have had 18,000 cases in 2018 (ongoing outbreak), Vietnam 5,000 cases in 2018 and there are many cases occurring in Indonesia including Bali. Even in Europe a number of countries including Poland (35/week)), Slovakia and Macedonia are reporting outbreaks in January 2019. Measles is more than a rash! After an incubation period of 10 days, the illness consists of fevers, coughing, conjunctivitis and a rash over the whole body. Complications include pneumonia ( 6%of people will get this), and a dreaded brain infection called encephalitis (fatality rate 10-15%). If you survive encephalitis it often leaves you brain damaged. So who should be vaccinated? 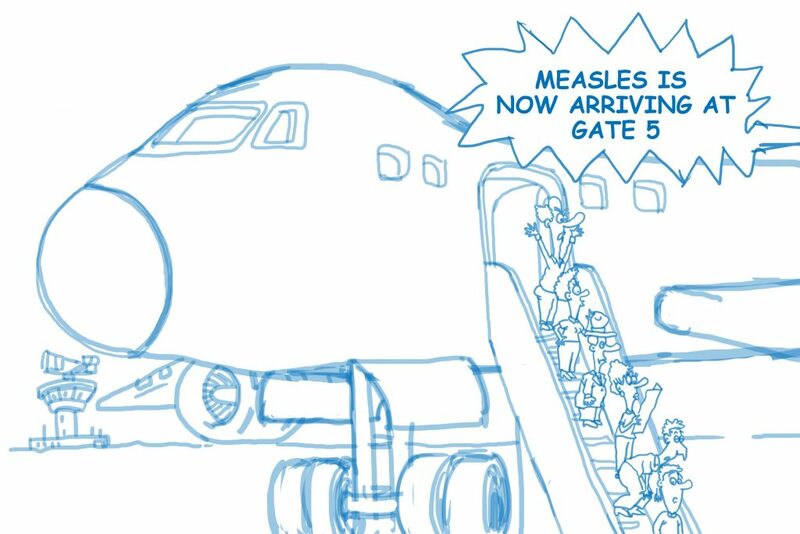 Check with your travel Doctor if there is an outbreak of measles in the countries to where you are travelling. Measles, in addition to the countries listed above, is also widespread in most less developed countries of Africa, Asia and South America. However, many people born since this time may not have had the 2 doses of measles vaccine required to give long term protection, so you can check old records, or have a blood test to be sure you are immune. The vaccine is safe for the vast majority of people. Some people can’t have the vaccine; it can’t be given during pregnancy, and you have to avoid conceiving for 4 weeks after the vaccine is given. The vaccine should be avoided if you have a suppressed immune system due to tablets like cortisone, if you have had chemotherapy in the last 6 months, or if you take other drugs prescribed by specialists to people with autoimmune diseases. The vaccine has to be given at the same time as other live virus vaccines (yellow fever, chicken pox for example) or otherwise 4 weeks after they have been given. Babies can be vaccinated as early as 9 months of age, so if you are travelling with your baby, before the routine 12-month vaccination for measles, an extra dose of the vaccine can be given early. KEEP YOURSELF SAFE FROM MEASLES!